Industrial and other commercial surfaces often require specialized interior and exterior paints and epoxy and urethane coatings. Devlin’s Painting makes sure all employees are trained and up-to-date on the most recent products and how to apply them for a long-lasting finish. We can clean and treat metal, wood, concrete and other surfaces in your industrial facility, restaurant, or other business or institution. 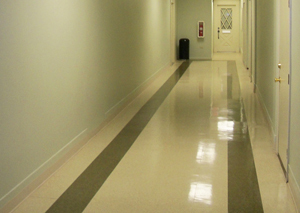 Our services include applying varnish and polyurethane to wood surfaces to give them a new sheen, and using a two-step epoxy process on commercial floors with high foot traffic. We maintain a full range of scaffolding and other equipment needed to complete large commercial jobs quickly and neatly, so your business or facility can continue to operate during any improvement project. Contact us to talk about your project ideas.